Chad has lived in Maryville since 1981. He has been married to his wife, Angie for 7 years- and has two beautiful children. Kayla is 4 years old, and Austin who 9 months old. For more than 14 years Chad has been helping people in Maryville and surrounding communities get newer vehicles. Chad is proud to continue to serve our customers with their automobile needs. Maggie was born and raised in Maryville. She has two children, Decota and Kenlee. She enjoys spending time with her family and friends, supporting Kenlee's competition dance team and cheering for the NWMSU Bearcats, Maryville Spoofhounds, and the Kansas City Royals. Maggie has over 10 years of office management and tax preparation experience and looks forward to serving you. 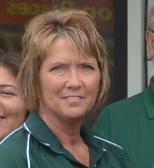 Mel is presently the Director of Athletics at Northwest Missouri State University. He was instrumental in making Northwest Missouri State University the football power house in NCAA Division II that it is today. Carol is the wife of Mel. She most recently was an instructor at Northwest Missouri State University, as well as a realtor in Maryville. She is currently enjoying her retirement and spending more time with her grandchildren. Rich is one of our partners. He also runs a Sur-Gro store. Rich is a big Bearcat supporter. In his spare time he enjoys watching Bearcat athletic events and spending time with his family. Bernie is the wife of Rich. They reside in Oregon, MO. Bernie like Rich, enjoys spending time with her children, and also cheering on the Northwest Missouri State University Bearcats!